Jessika Jenson of the United States hits the rail on the quarter pipe during her first run in the women's snowboard slopestyle qualifiers at Snowmass for the U.S. Grand Prix on Wednesday. Jenson ranked first in the qualifiers. Summit County teen Red Gerard was one of three Americans to advance to the men’s snowboard slopestyle finals Friday after a strong showing in Wednesday’s qualifying round. Gerard, already a virtual lock for the Olympics, scored 88 in his one and only run to finish second in qualifying behind Japan’s Hiroaki Kunitake, who had 90.75. The qualifying was called off after only one of two runs because of weather. A heavy fog that later turned into snow caused a long delay for both slopestyle and men’s ski halfpipe qualifying, which were going on at the same time Wednesday afternoon. While the halfpipe competition was able to complete both runs, organizers were forced to end the slopestyle qualifying early. Japan’s Yuri Okubo was third in qualifying with 87.25, Sweden’s Niklas Mattsson fourth (81.50) and Finland’s Rene Rinnekangas fifth (82.75). Alaska native Ryan Stassel (76.50) and Utah’s Chandler Hunt (72.50) finished sixth and seventh, respectively. Hunt entered the week third in regards to U.S. Olympic team qualifying, while Stassel is eighth. Norway’s Emil Andrew Ulsletten (71.50, eighth), New Zealand’s Tiarn Collins (70.75, ninth) and Sweden’s Mans Hedberg (69.25, 10th) rounded out the other qualifying finalists. Not competing was Summit County’s Chris Corning, a former Aspen Valley Ski and Snowboard Club athlete, who decided to sit out this week’s competition to heal from a minor injury. Corning already is qualified for the U.S. Olympic slopestyle and big air team. Judd Henkes, who entered the week fourth in the Olympic team standings, was among a large group of Americans not to make Friday’s finals, along with Brock Crouch, Eric Willett and Nik Baden. A pair of Americans competing for the fourth spot on the U.S. Olympic team advanced to the women’s snowboard slopestyle finals after Wednesday’s qualifying round, while a trio of Olympic front-runners will be notably absent for Friday’s finals. Idaho’s Jessika Jenson, a 2014 Olympian, finished atop the leaderboard Wednesday with a score of 89.75. Jenson entered the week fourth in the U.S. Olympic team standings and is trying to fend off New York-native Ty Walker, also a 2014 Olympian, who is fifth in the Olympic team standings. Walker’s qualifying run score of 68 was good for fifth place. Jamie Anderson, the reigning Olympic gold medalist from Tahoe, did not compete, instead choosing to stay in Whistler to train. Anderson is already qualified for next month’s Olympics. 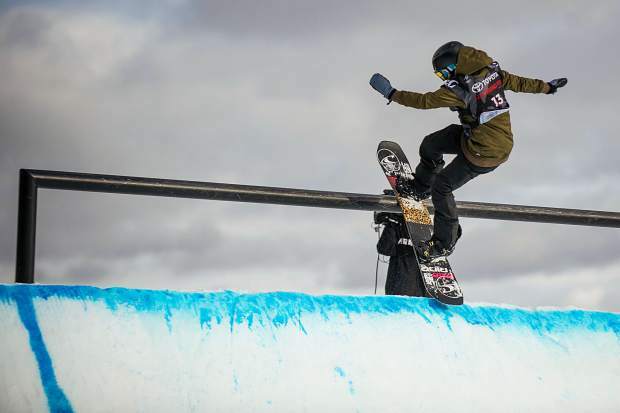 Second behind Anderson in the bid for an U.S. Olympic spot is Connecticut’s Julia Marino, the reigning X Games Aspen gold medalist in slopestyle. Marino’s best qualifying run Wednesday was 53, placing her in 11th place. Only the top eight made Friday’s finals. Also on the outside looking in is California’s Hailey Langland, who scored 32.75 on her first run to take 18th. Langland entered the week comfortably in third place in regard to Olympic qualification. Japanese teen phenom Reira Iwabuchi was second in qualifying with a score of 85.00, followed closely by New Zealand’s Christy Prior (83.75). Russia’s Sofya Fedorova was fourth (72.25), Australia’s Tess Coady sixth (62.25), Slovakia’s Klaudia Medlova seventh (60.50) and Canada’s Jasmine Baird eighth (58). Nora Healey, who is sixth in the Olympic team standings, was 12th in qualifying. Friday’s snowboard slopestyle finals are scheduled for 9:30 a.m. for both men and women.